Megatron Print offers a wide range of custom carbonless form options to fit a variety of business needs. NCR forms are available in a number of pages, referred to as parts, ranging from 2 to 6 parts depending upon your need. Carbonless forms can be printed on one side or two. Typically the front side includes the company logo and contact information as well as the form. The back side can be used for legal information or detailed instructions. 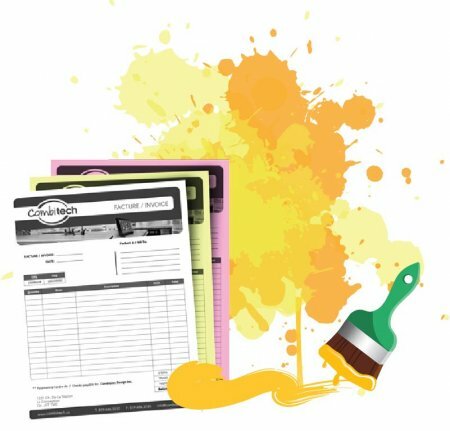 NCR forms can be printed in a variety of ink formats from black only to full-color, or even with custom PMS or spot colors to match your corporate branding. You can specify different ink options for the front and the back of the form. NCR booklets for receipt forms and invoice forms are very handy as a copy of the form can be easily torn from the booklet and given to the customer, while leaving a copy in the booklet for the business. Pages are perforated for easy removal. A sturdy cover wrap maintains the booklet's integrity and can be inserted between forms to prevent transfer when completing the form. NCR forms can be numbered for essential record-keeping. Just specify red or black ink and the starting number and all forms will be numbered sequentially.